After the brain-dead stretch from Brig this is heaven. First section quite steep but wide road, good surface, fast sweepers. 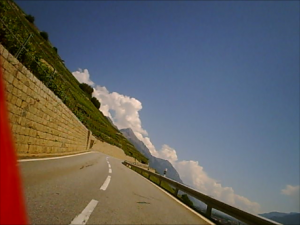 You get some good views of the vally back towards Martigny and beyond from the first few hairpins. A lot of traffic stops at the top. Down the other side into France is wooded and fast. The surface on the French side is still bumpy but not as bad as it used to be, narrow and often lots of traffic in the National Park, but the views of the Chamonix ski area, the peaks and the glaciers of Mont Blanc are stunning.